The Russian president says, "any accusations aimed at Russia (over former CIA contractor Edward Snowden) are nonsense and absurdity." President Vladimir Putin has said that former CIA employee Edward Snowden still remains in the transit zone of Moscow's Sheremetyevo airport and dismissed as absurd all accusations of Russia in relation to his arrival in the Russian capital. 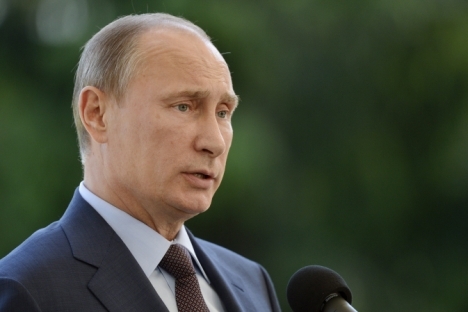 "He is in the transit zone as a transit passenger and remains there still," Putin said. At the same time, Putin has voiced hope that the situation involving Snowden won't hamper Russian-U.S. relations. "I hope this won't affect the businesslike nature of our relations with the United States. I hope our partners will understand this," he said. "Mr. Snowden is a free man. The faster he chooses his ultimate destination, the better for us and for him." "Our special services have never worked with Mr. Snowden and are not working with him today," Putin added. Russia may turn in criminals or suspects only to countries with which it has a relevant bilateral agreement, and there is no such an agreement between Russia and the United States, Putin said apparently in light of the U.S. efforts to secure Snowden's extradition. "Thank God, Mr. Snowden have not committed any crimes on the Russian Federation territory," Putin added. He recalled the situation surrounding WikiLeaks editor and founder Julian Assange, whom the U.S. also declared wanted. "As well as Snowden, he considers himself a human rights defender and is fighting for circulation of information. Ask yourself: should such people be extradited to be jailed or not? In any case, I would prefer not to deal with such issues, because this is just the same as shaving a piglet: too much noise but too little hair," Putin said. "Let Mr. Mueller [FBI Director Robert Mueller] and Mr. Bortnikov [Russian Federal Security Service Director Alexander Bortnikov] deal with this issue." Meanwhile, the Russian Foreign Minsitry believes that Snowden did not cross the Russian border. It is impermissible to accuse Russia practically of a conspiracy and violation of U.S. laws, Russian Foreign Minister Sergei Lavrov told a press conference in Moscow. The article is a combined report based on materials from Interfax.